← Calculating Azimuth And Altitude At The Assumed Position By Spherical Trigonometry. Boötes The Herdsman If we take a line from Alioth to Alkaid in the Great Bear and extend that line in an -imaginary curve for about roughly three hand-spans as shown in the diagram below, it will point to Arcturus, the brightest star in the constellation Bootes. Boötes is the 13th largest constellation and is located in the northern hemisphere and can be seen from +90 to -50. The ancient Greeks visualized it as a herdsman chasing Ursa Major round the North Pole and its name is derived from the Greek for “Herdsman”. Arcturus is the fourth brightest star in the sky and is a navigation star; it can be seen during nautical twilight in June. The ancient Greeks named Arcturus the “Bear Watcher” because it seems to be looking at the Great Bear (Ursa Major). Corona Borealis, The Northern Cross If we next take a line from Nekkar to Princepes in Boötes, and extend that line by about one and a half hand-spans, it will point to Nusakan and on to Alphecca in the nearby Corona Borealis constellation. Corona Borealis, whose name in latin means northern crown, is a small constellation in the northern hemisphere and can be seen between latitudes +90 to -50. Alphecca, the brightest star in the group, is a navigation star and is best seen during evening nautical twilight in July. The main stars in Corona Borealis form a semi-circle which is associated with the crown of Ariadne in Greek mythology. It said that the crown was given to Ariadne by Dionysus on their wedding day and after the wedding, he threw it into the sky where the jewels became stars which were formed into a constellation in the shape of a crown. 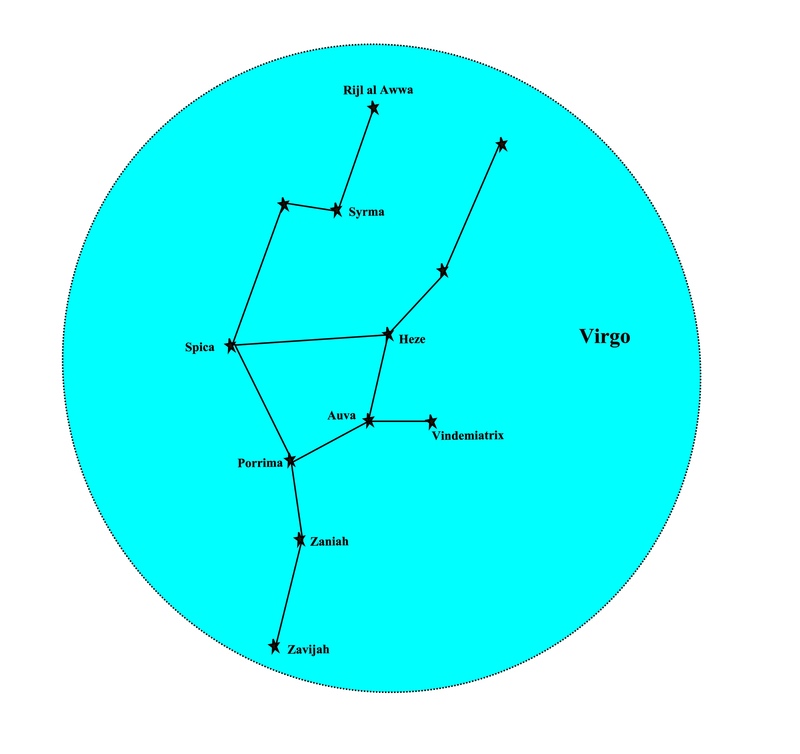 The constellation Virgo takes its name from the Latin for virgin or young maiden. 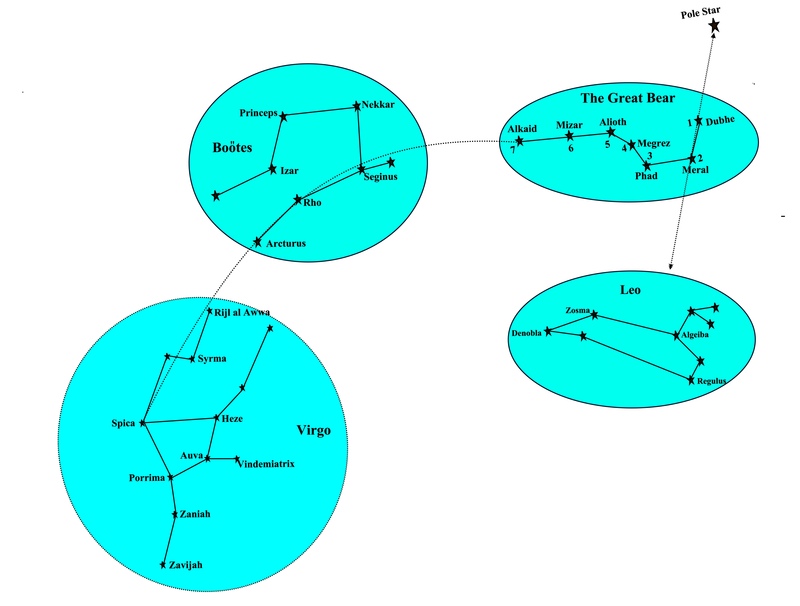 In ancient Greek mythology, Virgo is associated with the goddess Dike, the goddess of justice and as the diagram below shows, the constellation Libra, the scales of justice, lies next to Virgo. Virgo lies over the southern hemisphere and is one of the largest constellations in the sky, smaller in size only to Hydra. It is visible between latitudes +80 to -80 and for navigation purposes, it is best seen during evening nautical twilight in May. The brightest star in Virgo is Spica, the 15th. brightest star in the sky and a navigation star. As we learned when studying the constellation Boötes, an imaginary curved line from Alkaid in the Great Bear leads to the bright orange star Arcturus, in the constellation Boötes. If, as shown in the following diagram, we continue that curved line by another hand span from Arcturus we will come to the bright bluish-white star Spica, in the constellation Virgo which is to the left of Leo. Although this series of posts show the locations of certain constellations relative to other constellations in the sky, it does not necessarily indicate whether or not they will be visible above the horizon. That will of course depend on its times of rising and setting at the position of the observer. ‘Risings and Settings’ will be the subject of another post. This entry was posted in astro navigation, Astro Navigation Demystified, Astro Navigation Topics, astronomy, celestial navigation and tagged astro navigation, astronomy, celestial navigation, navigation, Planning star and planet observations. Bookmark the permalink.